Let me tell you about Phaedra. Not long after giving life to her precious progeny Dusty and Memphis the single mama and her pups hit on hard times and wound up at the Lancaster Animal Shelter. Luckily, the trio were brought to the attention of Sachi and were rescued before they could meet a horrible fate. This little family has been a fantastic addition to Sachi. Phaedra is an all around winner. She' not only a great mother, but also a perfect lady with people and pooches alike. Now that the kids are growing up Phaedra is ready to move on to the next phase of her life. 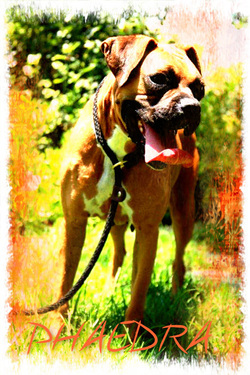 If you're looking for a magical Boxer girl to add to your family, Phaedra is her name! 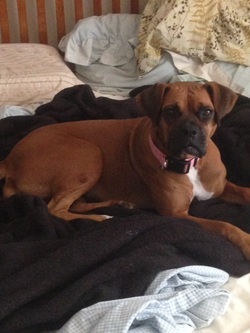 Phaedra is having a blast and a human bed to rest while in foster.